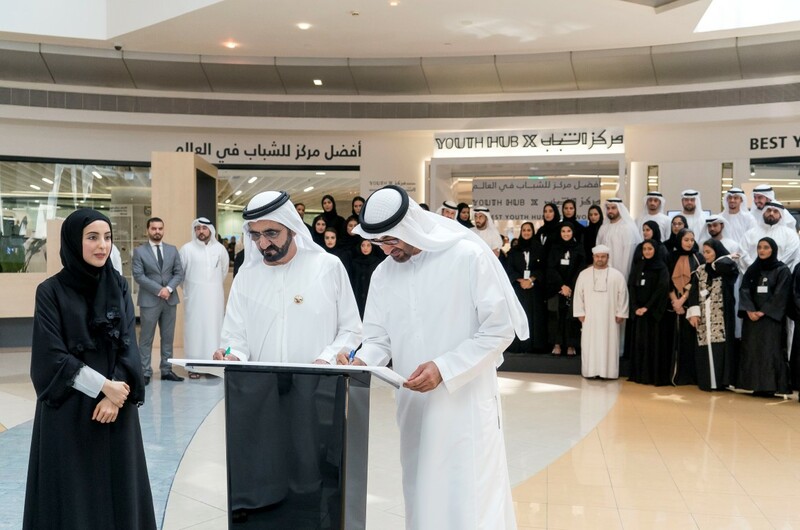 Vice President, Prime Minister and Ruler of Dubai, His Highness Sheikh Mohammed bin Rashid Al Maktoum, and His Highness Sheikh Mohamed bin Zayed Al Nahyan, Crown Prince of Abu Dhabi and Deputy Supreme Commander of the UAE Armed Forces, on Sunday inaugurated a youth centre in Dubai deemed as the best in the world, with all-inclusive services for young people below the age of 30. The centre comprises areas for journalists, entrepreneurs, researchers, programmers and gamers, and has an annual calendar of events and programmes. Designed by youths below the age of 30, it includes meeting rooms, areas allocated for youth projects, a library, a theatre, a workshop, and a studio for creative productions. Located in Emirates Towers, the centre will provide classes and workshops, besides hosting entrepreneurial projects. It also includes office areas for youths, volunteering and training opportunities, a cafe, and a theatre for youth events. A lab is also in the pipeline for brainstorming sessions that would lead to innovative ideas. 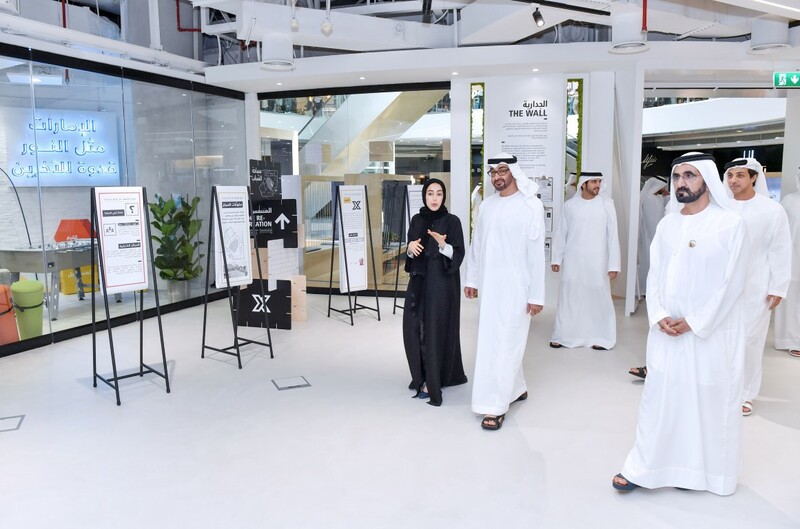 His Highness Sheikh Mohammed bin Rashid Al Maktoum and His Highness Sheikh Mohamed bin Zayed Al Nahyan have called for replicating this centre’s model throughout the country. The aim is to develop various forums for the youth, that enable them to serve the country, build their futures, and create innovations and projects that will shape the country’s future. On this occasion, His Highness Sheikh Mohammed bin Rashid said, " We, my brother His Highness Sheikh Mohamed bin Zayed and I, have directed the replication of the centre’s model all over the UAE as youth development is considered a great and comprehensive national mission, and we want to prepare them to lead the process of development in a great nation that is all inclusive. The youth of the UAE deserve the best and we expect the best from them, placing our faith in their abilities to create a better future for our country. "We want our youth to be the most professional and to have the most noble values. We want them to be accepting of the world and to be proud of their nation. We want the best for our youth and progress and development for our country," H.H. Sheikh Mohammed bin Rashid continued. "My presence with my brother Sheikh Mohamed bin Zayed today at the inauguration of this centre is a message to the youth that they have a great responsibility, and is also a message to all officials to give great attention to young people and to assign them roles to bear a part of this nation’s responsibilities," he added. 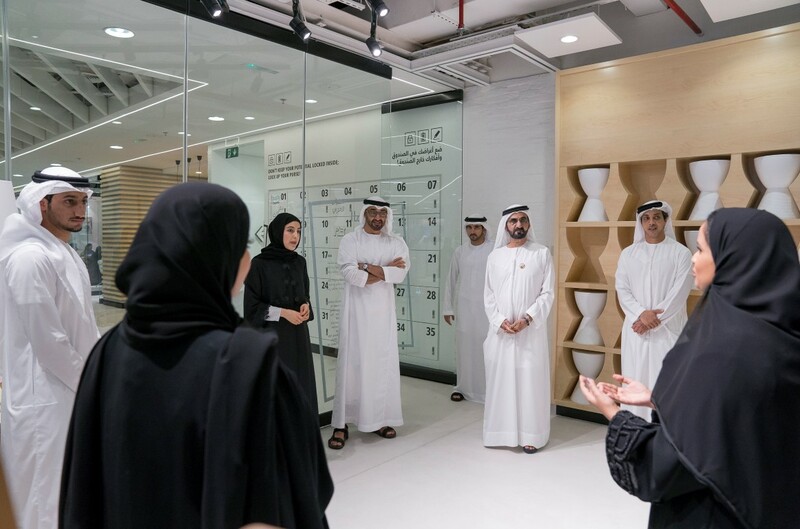 His Highness Sheikh Mohamed bin Zayed hailed the youth centre that is considered an exceptional addition and represents an environment that encourages youthful innovations. He stressed that investing in the youth is essential for the development of the country. "We expect from our youth great contributions to their nation, as they are the source of initiatives and leading ideas, and their contributions make us confident of a promising future. Young people will always be a top priority for President His Highness Sheikh Khalifa bin Zayed Al Nahyan and his brother Vice President, Prime Minister and Ruler of Dubai, His Highness Sheikh Mohammed bin Rashid Al Maktoum," he added. His Highness stressed that the national development process has succeeded, due to an environment that encourages the youth and provides the tools to help them innovate and achieve success, while noting that the centre and other youth centres are essential components in this approach. He also wished the people of the country greater success and encouraged them to work and participate in the journey of giving, for the advancement of the nation. His Highness Sheikh Mohammed bin Rashid Al Maktoum and His Highness Sheikh Mohamed bin Zayed Al Nahyan toured the centre, while accompanied by Shamma bint Sohail Faris AlMazrui, Minister of State for Youth Affairs, who supervised the centre’s development, in cooperation with the country’s other youth centres. During the tour, and through a closed TV circle, she spoke about the Emirates Youth Council in the United States, which recently organised the Zayed Youth Forum and achieved key successes, due to the directives of His Highness Sheikh Mohamed bin Zayed Al Nahyan. During his talk with the Youth Council in the US, His Highness Sheikh Mohammed bin Rashid stressed that the council’s participants are all ambassadors of their nation, with a mission to return home to serve their country with the best levels of knowledge, experience, research and certificates. He also praised the forum, adding that the late Sheikh Zayed bin Sultan Al Nahyan is a source of inspiration across the world. His Highness Sheikh Mohamed bin Zayed expressed his pride in Emirati youth living abroad, as they are fulfilling their national duty while carrying the ambitions of the UAE people and realising their nation’s future. "All our youth have great responsibilities, but the responsibilities of our youth abroad are doubled, because they are representing an entire nation, and therefore must also be the best ambassadors of their country," he added. 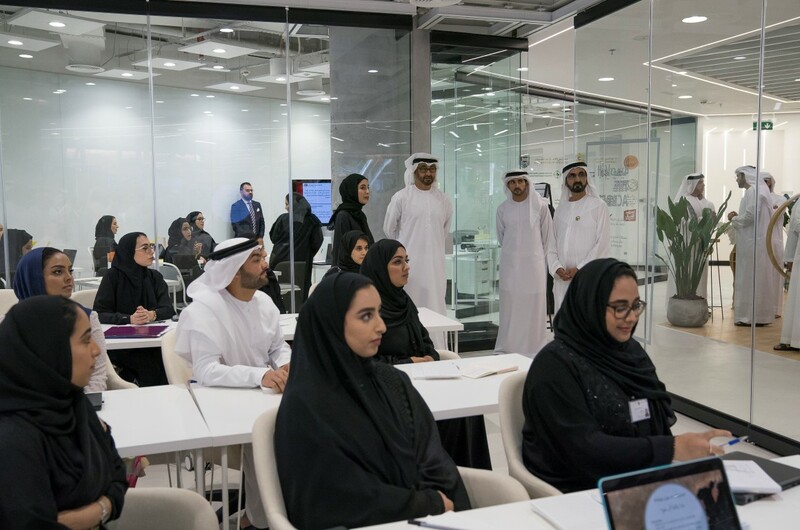 "The youth who are armed with knowledge and learning, and are up to date with this era’s development, are the cornerstone of the nation’s advancement, and we are looking forward to their return and to see them participate with their peers in the UAE’s development and promoting its international stature," he added, while wishing Emirati youth abroad greater success and excellence. Also present during the tour were H.H. Sheikh Hamdan bin Mohammed bin Rashid Al Maktoum, Crown Prince of Dubai and Chairman of Dubai Executive Council; H.H. Sheikh Mansour bin Zayed Al Nahyan, Deputy Prime Minister and Minister of Presidential Affairs; Mohammad bin Abdullah Al Gergawi, Minister of Cabinet Affairs and the Future, and Mohammed Mubarak Al Mazrouei, Under-Secretary at the Abu Dhabi Crown Prince’s Court.